Kongo Gumi was the oldest continuously operating family business in the entire world until last year, when massive debt forced it to shut its doors. 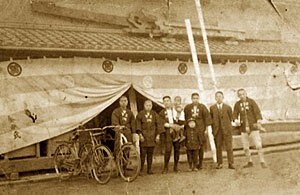 Since the firm's founding in the year 578, forty generations of Kongos had run the company, which specialized in Buddhist temple construction. What brought an end to Kongo Gumi's fourteen-hundred-year run? It is a sad but all too common tale: speculation in real estate. Kongo Gumi in happlier times.